The current International moth is a result of merging two separate but similar historical developments. The first occurred in Australia in 1928 when Len Morris built a cat rigged (single sail) flat bottomed scow to sail on Andersons’ Inlet at Inverloch, a seaside resort, 130km from Melbourne. She was hard chined, was eleven foot long, and carried 80 sq ft in single mainsail. The craft was named “Olive” after his wife. The construction was timber with an internal construction somewhat like Hargreave’s box kite. 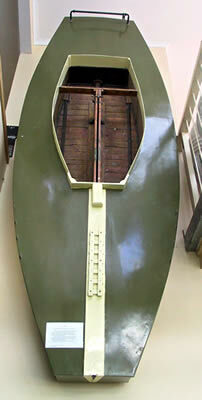 “Olive’s” performance was so outstanding, that a similar boat “Whoopee” was built. Len Morris then sold “Olive”, and built another boat called “Flutterby”, and with those three boats, the Inverloch Yacht Club was formed. Restrictions for the class known as the Inverloch Eleven Footer class were then drawn up, with the distinguishing characteristic that of being not a one-design boat but rather that of a boat permitting development within the set of design parameters. At much the same time, 1929 in fact, halfway around the world another development class, the American Moth Boat was started by Captain Van Sant of Atlantic City, New Jersey with his boat “Jumping Juniper” built of Atlantic White Cedar from the Great Dismal Swamp. The US development class was formally organized in 1932 as the “National Moth Boat Association” and in 1935, due to increasing overseas interest, changed its name to the “International Moth Class Association” or IMCA. This is the first Moth ever built called Olive. It currently resides hanging up inside the doorway of Albert Park Yacht Club in Victoria, Australia. It has been fully restored by the Old Wooden Boat Assocation of Victoria. In October of 1933, an American magazine, The Rudder, published an article dealing with the Moth Boat scene in US. The Australians noted the similarities between the two groups of boats and intuitively realized that the name “Moth Boat” rolled more easily from the tongue than “Inverlock Eleven Footer Class”, so they changed the name of their class to Moth and adopted the “squashed bug” that was shown in the article as the class sail insignia.. The Australians also noted the differences, particularly in sail plan between the two boats, but since this was in the middle of the great depression, and the two groups were 13,000 miles apart, no attempt was made to reconcile these differences. The US fleet, and later the British and European moths, adopted a “circle M” for their sail insignia. Thus two large Moth classes developed separately for over 30 years. Also, in the early 1930s a small group of sailors in Great Britain formed a “British Moth Class”. The British class was restricted to a particular hull shape of a 1930s Vintage American Moth Boat, and is thus not a development class. Meanwhile, in Australia, in 1936 the Victorian Moth Class Association was formed, but it was not until after WWII, that the NSW Moth Class Sailing Association was formed with foundation members coming from Seaforth Moth Club and Woolahra Sailing Club. During this time Australian Moths were using pre-bent and wing masts in the 1950s. From 1956 to 1961 all other states formed Moth Associations and in 1962 the Australian Yachting Federation (AYF) recognized the Australian Moth class as a national class, the FIRST small boat class in Australia to be granted national status. After the Second World War, more and more European interest in the Moth Boat was expressed. The European Moth clubs subscribed, more or less, to the US class rules. One European Moth design from the early 1960s, the “Europa Moth”, broke away from the IMCA and formed the one-design Europe dinghy class and became the woman’s single-hander used in the Olympic games from 1992-2004. Also in the 1960s, the Australian Mothists began campaigning for rules changes that would permit the Australian Moths to compete in the IMCA’s “World Championships”. In 1971 the US-based IMCA completed a phase-in of new rules which attempted a “marriage” of the IMCA and the Australian Moth. This amalgamation process had started at the annual IMCA meeting in 1965. New rules embraced the more powerful high aspect, loose footed, fully battened rig of the Australian Moth and the squashed bug insignia. The new rules also permitted controversial hiking wings first seen on Moths from Switzerland. Finally, the rule change abolished the US centralized organization of the class in favor of an independent world body with equal-partner national associations. Each national association elected its own officers and world body representatives. The culmination of these changes was the recognition in 1972 of the IMCA by the International Yacht Racing Union (the forerunner of today’s ISAF) bound by the agreed upon new restrictions of the class (with metric measurement conversions) operating today. The moth class association that had originated in the US was now truly an international organization. Being a development class, the moth has evolved from a hull in the 1930’s that could best be described as a heavy, narrow scow or a blunt nosed skiff, (weighing about 50 kg) to today’s remarkable foilers with hull weights of under 10 kg,. Designs have run the gamut from wide skiffs without wings, to lightweight scows, to wedge-shaped hulls characterized with narrow waterlines and hiking wings out to the maximum permitted beam. Likewise, the sail plan has evolved from cotton sails on wooden spars, through the fully battened Dacron sails on aluminum spars stage, to the windsurfer inspired sleeved film sails on carbon masts seen today. The International Moth has fostered a number of remarkable achievements. For example, in 1966-67, The King of Siam was involved in the building of three Moths and sailed them on the pond at Chitrlada Palace. The King raced for almost 20 years on his second moth called ‘Super Mod’ until his design and construction efforts were cut short by the ‘press of royal duties’. In 1957 Patricia Duane became the first women to win the moth world championship in her Cates-Florida design and in 1968 Marie Claude Fauroux became the first woman skipper to win a World dinghy racing title from a IYRU sanctioned international class – in her Duflos designed moth. The International Moth was selected as an official training class for the Japanese Olympic sailing team, to hone their balance skills. And of course, the moth has become the standard of a successful hydrofoiling class, with most foils and control systems based on developments by John Ilett in Australia.